I’m reliable. You can count on me. Really. You can count on me not to listen to my voicemail. You can count on me to show up 15 minutes late. And you can count on me to be poorly prepared for just about everything. But in the end, I will get the job done. I will make a huge mess in the process, but I’ll get it done and I’ll have fun doing it. I don’t know…I’m all for teachers, but it seems like overkill to me. What happened to the days where the kids saved their milk money, pooled it all together and then went out and bought Teacher a month’s supply of BubbleYum? Paper. I used old packing paper, because I’m all about reusing. Squeeze bottles. I used old water bottles. Acrylic paint. The kiddo paint is too chalky for me, so we used the real deal. Hole punches. I used a double hole punch and a 2” punch. Thin wire cut into 2” lengths. I used floral wire because I had it lying around, but any thin wire would work. Plastic “pony” beads (I used clear because I didn’t have beads that matched my papers. Scenting oil. You can use essential oils, your own perfume, even a drop of vanilla from your spice cabinet will work. 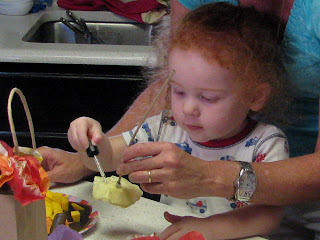 First we taped down sheets of paper, filled squeeze bottles with a dollop of acrylic paint mixed with about a cup of water. We shook up the paint and squeezed, splatted and splooshed it onto the paper. OK, so some of it got squeezed other places too. Hey, messy = fun, right? Once the paper dried, the kids cut out circles. What kid doesn't love to play with scissors?! And for this project, the more irregular the cutting and the less exact the size, the better. It's a win/win. While the kids were cutting their circles, I punched 2" circles out of used tissue paper in coordinating colors. I also used the double punch to punch holes 'near' the center of each circle. Again, lack of precision gives a better end result, so kiddos strong enough to operate the punch could participate in this step as well. Next, I threaded a button and 6 paper circles (alternating painted paper and tissue paper) onto the thin floral wire and twisted the wire on the back side to hold everything together. This was Buddy Boy’s favorite part. Crumple everything up into little balls creating “buds”. 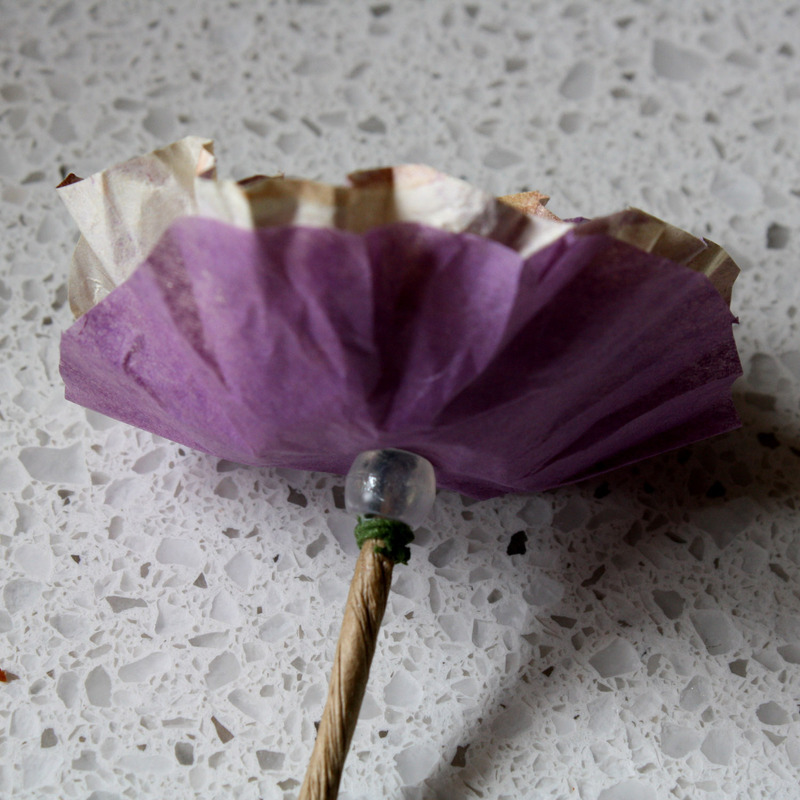 Then I attached each bud to a paper-wrapped stem with a drop of glue and slid a pony bead onto the stem to secure it all and give it a nice finished look. You could cover all this up with floral tape, but I couldn't find any 'craft' color tape to match my stems, so I just left it as it was. 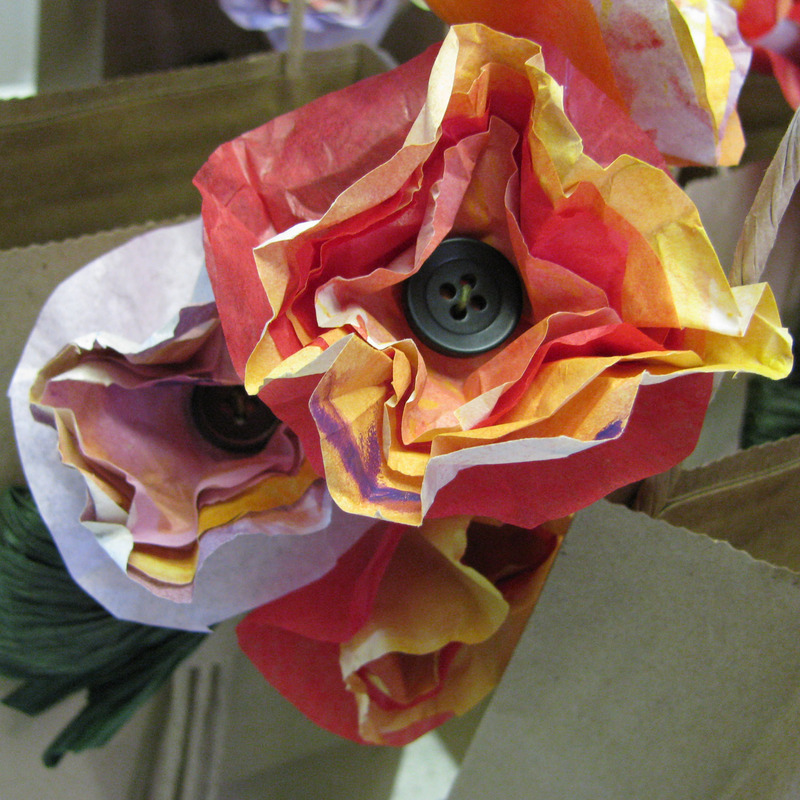 After the glue dried, we carefully unfurled our flowers. The last step was to apply a drop of scent oil to each flower. Voila!! 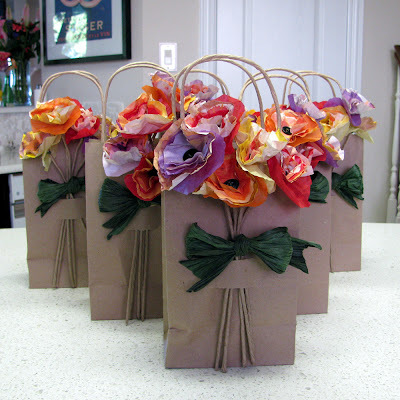 A sweet smelling bouquet for teachers. 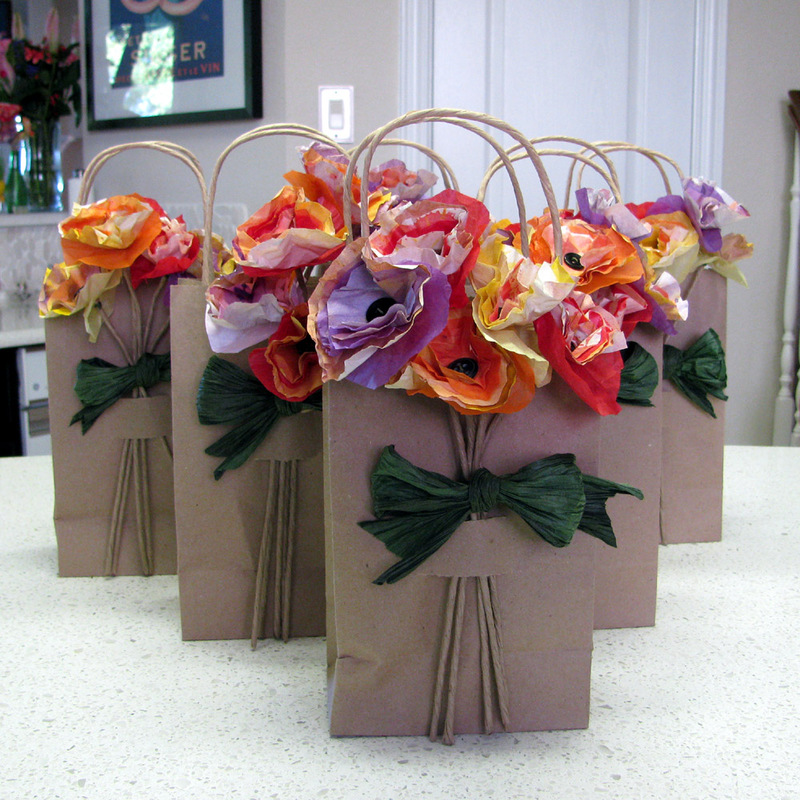 We used them to dress up the outside of plain brown paper handle bags filled with homemade cookies. Denise, you make the most amazing handmade gifts. Their teachers are super lucky to get those gifts! I agree though...all of that is a little bit of overkill, even if it is to show some well deserved appreciation to hard working teachers. i like to give gifts to teachers. because i totally love one-upping all the other moms. and no. i didn't mean to strike that out. thanks for the tute. but i'm not sure i need it since i have you to make them for me. also. maybe the teachers might appreciate a spoon/cutting board set? Thanks for sharing your wit and gifts! True friendship is like a rose: we don't realize its beauty until it fades. Flowers gives the way for the true expression of your feelings. This website is providing very good flower ideas and offerings. Thanks for teaching us this origami technique, I think these flowers would stay fresh longer than natural. Really a very nice blog and it is providing the good information about the Best Practices Guide and it is nice to read the information provided and such blogs help to students to find the proper way for their carrier and it is better approach to carry on the education. IMHO, I actually do absolutely fit many of us, in the event that we possess a a bit of several other mind-set as well as we are going to neo naturally exactly the same thing section. However, I'd like to be able to highlight the woman author's ease of build fascinating sms, his personal erudition or maybe hopeful piece on inetrnet. Bless you. Send Flowers & Gifts Online eFloralgifts is one of the premier floral and gifting retailer, offering gifts for all occasions like Birthdays, Anniversaries , Thank you , Weddings, Sympathy and many others.